↑ Najmi, Quaid. "Meet Mumbai's rags-to-riches Restaurant King". The New indian Express. Retrieved 31 May 2015. ↑ Patrao, Michael. "Taking pride in our very own pav". Deccan Herald. The Printers (Mysore) Private Ltd. Retrieved 31 May 2015. ↑ Patel, Aakar. 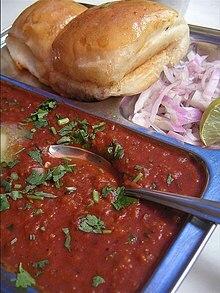 "What Mumbaikars owe to the American Civil War: 'pav bhaji'". Live Mint. HT Media Limited. Retrieved 31 May 2015. ↑ Pathak, Anil. "'Bhaji pav' to invade NY's Times Square". Times of India. Bennett, Coleman & Co. Ltd. Retrieved 13 January 2015. ↑ Rajesh, Monisha. "10 of the best street foods in Mumbai". The Guardian. Guardian News and Media Limited. Retrieved 2 September 2015. ↑ Dalal, Tarla (2010). Mumbai's Roadside Snacks. Mumbai: Sanjay & Company. p. 60. ISBN 978-81-89491-66-6. Retrieved 31 May 2015. ↑ Kumar, Shikha. "In search of the perfect pav bhaji". Hindustan Times. HT Media Limited. Retrieved 4 March 2017.